Well everybody is supposed to get 15 minutes aren’t they? 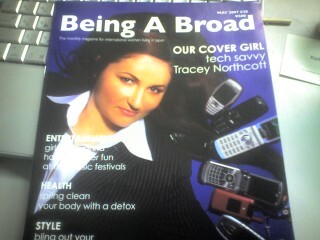 Anyway, here is the finished cover for May’s Being a Broad magazine. It was a heap of fun doing the shoot. I will get a PDF of the cover and article so I can send it around to people (yes Mum for you!!) so you can email it to all your friends. Go on, get yourself a subscription - it is fairly cheap for the year and a good read. If you are living outside Japan, just send them a note and ask them for international subscription rates. Very nice - Hubba hubba, indeed! You carry a lot of phones! I like how they hover around your head like a halo. Cor check out that saucy cover girl! Gosh - I may blush!!! Matti - I was lying on the floor and minions were hovering around arranging hair, make-up and cellphones.. (no shoes as they were left at the door) It was fun to do, but hard to stay still while all this was going on around me. Wowzers T - you look SENSATIONAL!